Our Key West roulette chips are real clay in six bright colors and feature an elegant "reverse inlay," a Key West logo in white and sea foam green on a black inlay with no denominations. 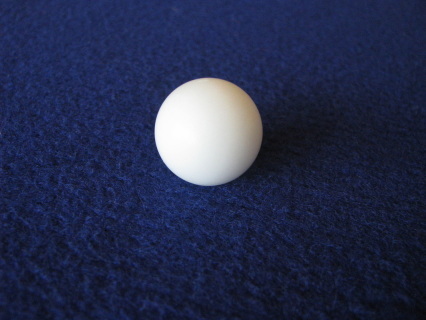 The bright colors and black inlay make for a great combination and set them apart from our denominated table chips. 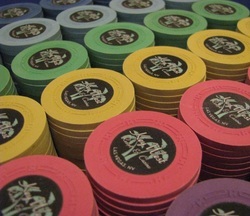 They're real clay clay H mold chips, like our Key West denominated chips, and can double as NCV or tournament chips. Roulette chip colors: Bliue, light blue, DG Green, DG Yellow, DG Pink, Lavender. (Click on the photo to enlarge.) 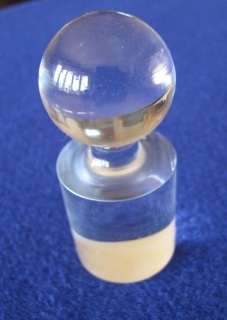 Price: $7.90, plus shipping. Show European style and grace with this beautiful aluminum roulette rake. It telescopes to 27 inches, with a clear acrylic front scoop that measures 8 inches across. 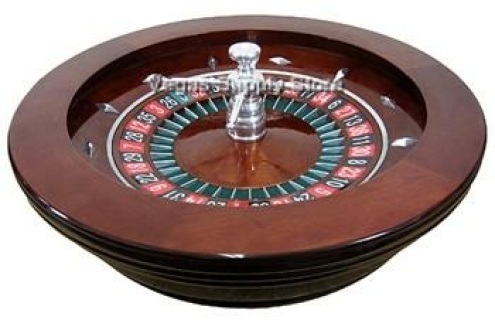 The roulette wheel rated "casino use" meets or exceeds the standards for precision required by licensed casinos, and is recommended by our manufacturer for use in licensed casinos. To avoid delays, you can order roulette wheels by phone at (302) 256-9484, or e-mail orders@keywestresortcasino.com. We'll invoice you for the total due and rush your shipment!